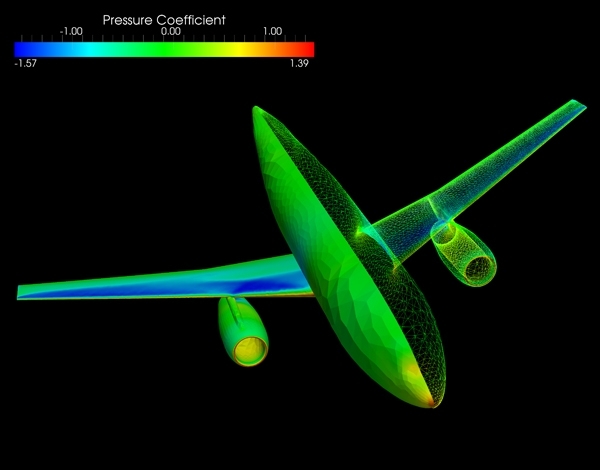 Image generated by SU2 showing air pressure on the structure of a commercial airliner in flight. Stanford University Unstructured (SU2) is an open-source software package that gives advanced engineering students a crucial leg up on the time-consuming process of writing their own code to optimize aerospace designs – offering for free an ability that is otherwise available only in expensive commercial applications. Each fall at technical universities across the world, a new crop of aeronautical and astronautical engineering graduate students settle in for the work that will consume them for the next several years. For many, their first experience in these early months is not with titanium or aluminum or advanced carbon-fiber materials that are the stuff of airplanes, but with computer code. Thanks to a team of engineers in the Aerospace Design Lab at Stanford University, however, those days of coding may soon go the way of the biplane. At a recent demonstration, the Stanford team debuted "Stanford University Unstructured" (SU2), an open-source application that models the effects of fluids moving over aerodynamic surfaces such as fuselages, hulls, propellers, rotors, wings, rockets and re-entry vehicles. Dubbed SU2 for short, the application incorporates everything engineers need to perform a complete design loop for optimizing the shapes of aerospace systems. While commercial programs offering similar capabilities are available, they can be prohibitively expensive. SU2, on the other hand, can be downloaded for free from the lab's website. In engineering circles, the discipline is known as computational fluid dynamics, or CFD. Creating custom software applications to accurately model the interactions of an object in flight can take months, even years, to write and perfect. And yet, when the student graduates, the software is often forgotten. "These are incredibly complex calculations involving innumerable variables," said Tom Taylor, a doctoral candidate who studies the dynamics of fluid flows beyond the sound barrier. "Essentially, every student has to create their own code for their specific designs, even though the equations at the core are virtually identical." SU2 is the product of a team led by research associate Francisco Palacios, in the Aerospace Design Lab, who works on complex simulations of the propulsion systems in hypersonic vehicles. Palacios witnessed all the coding the students around him were doing and, realizing that much of it was built upon a common foundation, decided to combine their work. Palacios, together with lab director Juan Alonso, then led a team of multi-disciplinary engineers in compiling, debugging and documenting the application that became SU2. "The commercially available software is out of reach for most students," said Palacios, "and does not allow for modifications to the source code that are needed for doctoral-level research. It occurred to us that all this time and effort could be combined and packaged to allow students to focus more on their research problems and less on writing code." Fluid dynamics applies to any three-dimensional structure moving through a medium, including air, water, chemicals and even blood. "People can use this for everything from rockets to the design of more efficient wind turbines, and even boats, racecars and more," said PhD candidate Sean Copeland, who specializes in re-entry of space vehicles. "Just plug in the geometry of your plane or wing or rotor, and tell the program to increase lift or reduce drag, for instance," said Tom Economon, a doctoral student working on efficient and quiet engine design. "SU2 goes to work, optimizing the shape for you in an automated way, showing you exactly where to alter your designs for maximum effect." "I often work on modeling plasmas," said PhD candidate Amrita Lonkar, who studies flow control over wind turbines. "It was really easy – so easy – to modify the program for my research. For me, it reduced about a year's worth of work to just four months." SU2 is a freely customizable software package. In true open-source fashion, developers, designers and engineers are encouraged to make the software their own, customizing the application to fit their needs. "We welcome corrections, additions and improvements to our application," said Palacios. "They help everyone." Of all SU2's many virtues, however, the most promising is perhaps its documentation, including a quick-start guide and in-depth tutorials. Absent or inadequate documentation is a problem that plagues many scientific computer codes. "These materials are exhaustive and continually updated," said Taylor. "Students can hit the ground running." Like the source code, the documentation and training are available via the website, which also includes a public forum where users and developers can seek advice and post support questions to a growing SU2 community. "We are proud of SU2. We hope that students will use it to focus not on coding, but on their research creating better aerodynamic designs," said Palacios. "This is, after all, the real reason they came to school." The Stanford Aerospace Design Lab is led by associate professor Juan J. Alonso and assistant professor (consulting) Karthik Duraisamy. Research associate Michael Colonno, post-doctoral researcher Jason Hicken and doctoral candidate Alejandro Campos also contributed to SU2.